A top international oil and gas refinery on France’s western coast recently initiated a €400 million facility upgrade at their refinery to capture profitable new markets in low-sulfur fuels that meet evolving European Union specifications. This substantial investment will significantly improve the refinery’s profitability and secure its long-term future. 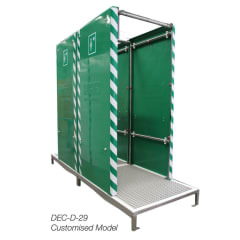 The organisation were looking for a PPE decontamination shower that allowed an extended damping time to provide additional assurance throughout the decontamination process, alongside automatic activation. It was important that the unit complied to industry standards.